As every week, we have some sweet new stuff for you. We went back to take a look at all the armor in the game and reworked all helmet appearances and armor values. What is more, we added some missing body armors to get a nice progression of armor values into the game. 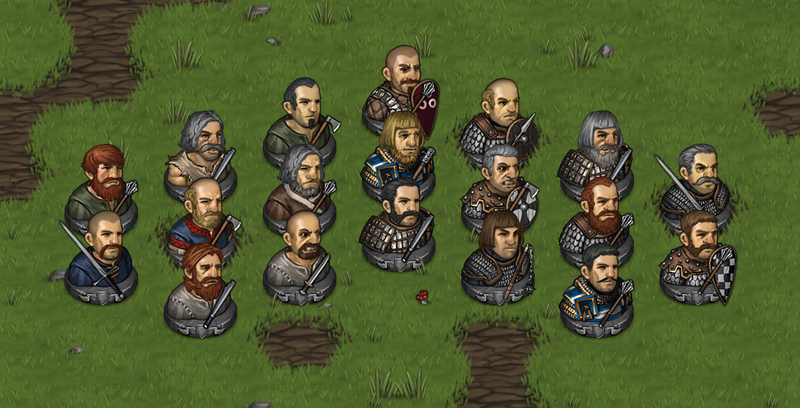 To round things up, a banner generator is in the works that will allow you to create your very own custom banner when starting a new game of Battle Brothers. Lets explore this in more detail. We want to have a smooth progression of both the protection that armor offers, as well as their price and how rare they are in the game. 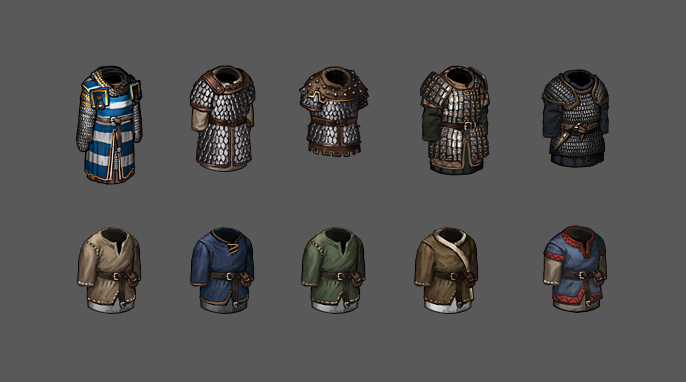 Until recently, there were some big jumps in armor values – for example there was little inbetween a simple mail shirt and the heavy coat of plates. With some new armor added, we filled these gaps and now have a great and steady progression. The heavier armors are quite expensive and hard to come by, so you’ll likely only be able to afford them later in the game. They’re also quite rare so that you’ll never find them on offer in great quantities and only in rich cities and strongholds to begin with. The protection from armor is crucial though, as a Battle Brother with little or no armor may be struck down with a single lucky hit. Before you know it you’ll see heads flying about left and right if you don’t get your guys some protection. Just take a look at our last gameplay video showcasing a tough and gory fight against orcs: Orc Line Battle Video. Heraldic Coat of Plates: Two layers of leather with heavy metal plates rivetted inbetween on top of a full mail shirt. Coat of Scales: A heavy armor made of overlapping metal scales covering most of the body. Scale Armor: A body vest with overlapping scales. Heavy Lamellar Harness: A lamellar armor that covers most parts of the body with thick, overlapping metal plates for maximum protection. Mail Shirt: A mail shirt with shoulder guards providing excellent protection against most weapons. On the bottom row we have a variety of linen tunics to get some more flavor into that early game when you’re hiring farmhands, lumberjacks and fishermen that don’t own any armor of their own. Until now all helmet variations within the same category were just visual flavor. This led to the odd situation where a helmet with a complete mail coif underneath gave the same amount of armor points as a helmet with just a piece of cloth underneath. To remedy this we split all visual variations into items of their own and gave them individual levels of armor points, malus to maximum fatigue and to sight range. This way we now have a ton of unique helmets and you’ll be able to instantly recognize which helmet will grant more or less protection or inhibit your Battle Brothers’ field of view. What you see is what you get, basically. We’re happy now with the variety of armors and helmets in the game and feel that they’re ready for our upcoming Early Access release. For the final game there’ll also be unique legendary items that come with their very own visuals, name, background story and sometimes even magical properties. They’ll be very hard to get and we’ll do a dedicated article on them in time. When starting out with your brand new mercenary company you’ll get the opportunity not just to name it, but also to create a custom banner for it. Just like the player, all locations – villages, watchtowers or orc camps – will have their own banner, as will the parties that originate from there. This way you can quickly identify a party’s affilliance and know where they come from. 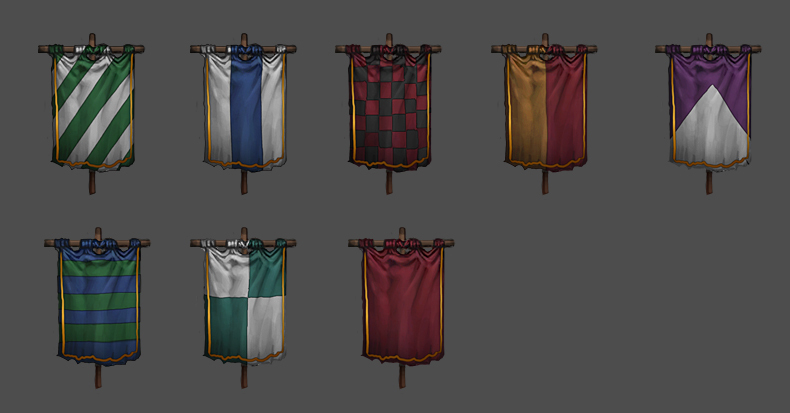 There will be a variety of banner shapes to choose from. Here are some examples we created to show the possibilities of the banner generator with included main emblem and secondary emblem. Note that these are still in development and not implemented in the game yet. Is that all the armour done? More weapons next? Well, all the armor for the first release at least. While we do have a bunch more weapon types planned, they’ll have to wait until later. Next up is a rework of the worldmap visuals. Is there only magical armour to come? Or more ordinary armour? that basically comes down to balancing. If we feel like there’s not enough progression/choice with the armors we got now, we will add more, but I think we should be fine, at least for the Early Access. BTW Do you plan a DRM Free version? I mean no Steam? Like GOG or directly from your site? Great. Good news. I hope there will be possible to Early Access for no Steam because I really want to grab this game. Game looks amazing. I dig your forum and two others and I can only say: Amazing! Its kinda game I always want to make if I ever won lottery ticket. Anyway I wanna ask how customizable sand box game will be? I ask about start options and difficulty levels. Is there will be possible to make some sort of advancement start options? Kinda like in Civilizations games? Like wealth level(effect how rich or poor starting towns/villages are) or Order level(affect number and strength of military) etc. So if player wish he can start game in crapsack world poor and full of bandits or in pretty nice rich country where law and order is strong. I think it will provide higher replay ability value. The other thing I wanna ask are difficulty levels. Are they planned to be implemented and how they will be handled if they are? Thanks! We’re always happy to hear that you guys are looking forward to the game as much as we are. Yes, there will be difficulty levels. How many, what they’ll govern exactly and how customizable they’ll be is still to be determined. Most likely they’ll influence the flow of money and how fast the invasion escalates on the strategic level. None of us here are fond of bloated hitpoint levels at harder difficulties, so we won’t go that route. I’m personally also against gimping the AI at lower difficulties, but we’ll see. We’ve thrown about some ideas for starting options but nothing has been decided so far. The thing is, the world is running a simulation with a simple but real economy – having setups too drastically different could easily shift the balance of the world and have it either completely crash and burn or solve all problems on its own while the player is powerless to do anything about it. Not the most fun for the majority of players, I imagine. That said, I agree that different starting options would be interesting and we’ll definately look into it. It’s also quite possible we’ll add them after the initial release. I agree with you about your look at difficulty levels. Scarcity of funds will directly affect how strong and equipped band is and also make mistakes or losses more hard to recover. Changing stats is no good. Although maybe you can look into changing enemy group structure. Adding additional necromancer to band of undead will make harder to fight them without changing stats or gimping AI. More options mean more fun. And even some crazy broken setup might be great for a story(like fighting against powerful enemy and seeing world burn around you with little to no possibility to stop them – its fight not to win but to survive how long you can – it be fun in different way). How exactly economy will work? I read about generation of wealth and health but if there will be something more? Like villages supplying town with food and resources and town producing goods etc? Also how strongholds will be funded? Do they send tax collectors to settlements to get funds and supplies? Will there be independent merchant/traders who travel around world for gain? They can move and generate some wealth for settlements they visit but mostly for themselves(when they get rich they can retire in cities adding their wealth to them). Will there be independent free companies like player Band of Brothers? Who look for contract and possibility to enrich themselves? How information will flow in this world? Do player need visit city to get contract from them or that he can hear some rumours when he visit other cities that this city need a company of mercenaries? Anyway game looks great so far. Bit shame that there is no updated demo but I understood that you have more important things to do. So when will be possible to get hands on this game in making? Are there be possibility for early access before early access? How much it will cost? Thank you for your reply and sorry for wasting your time. Hope that I don’t bother you too much. That’s a lot of questions. Can I trouble you to post them in our forums? I’ll do my best to answer them there. The comment section isn’t the best medium for so much text. We are sure that the game would greatly profit from easy modability but we are very limited on our resources. For the EA there will be no active mod support but we will have to see for the final version.